This special issue provides a synthesis of the status and development of marine protected area (MPA) networks at regional, national, and subnational scales in response to the Coral Triangle Initiative on Coral Reefs, Fisheries and Food Security (CTI-CFF) commitments to establish a Coral Triangle Marine Protected Area System (CTMPAS) to reduce threats to marine resources in the region. Please click here link to view the articles. The link to the article also available in the CT Atlas Publication and ReefBase online library. With the completion of the US CTI Support Program (USCTI) this year, the Coral Triangle (CT) Atlas team and supporting partner organizations have agreed on a coordinated plan to ensure support for and the sustainability of the Atlas beyond the life of USCTI. The sustainability plan, drafted at a meeting here last 14-16 May, calls for Penang-based WorldFish to take the lead in maintaining and managing the Atlas, while recognizing that its ownership resides primarily with the six member-countries of the Coral Triangle Initiative on Coral Reefs, Fisheries and Food Security (CTI-CFF). The CT Atlas is an online GIS database developed with the support of USCTI through the collaborative effort of five international NGOs, namely, The Nature Conservancy (TNC), World Wildlife Fund, International Union for Conservation of Nature, Wildlife Conservation Society, and WorldFish. TNC initiated and for the past four years led and coordinated the development and management of the database system in close association with WorldFish. CTI-CFF is a multilateral partnership formed in 2007 to address the urgent threats facing the coastal and marine resources of the CT, one of the world's most biologically diverse and ecologically rich regions. It includes Indonesia, Malaysia, Papua New Guinea, Philippines, Solomon Islands and Timor-Leste. The CT Atlas is intended to serve as an online resource for these six countries and to provide GIS expertise, mapping services and access to a regionally consistent database on a common platform with common information and resources. It was officially recognized by the CTI-CFF Council of Senior Officials at their meeting last November 2012 as integral to the implementation of the CTI-CFF monitoring and evaluation (M&E) System. The plan has obtained a preliminary commitment of support from the Asian Development Bank (ADB) Pacific Program. As agreed during last week’s meeting, WorldFish will submit to ADB a proposal for funding that will help ensure the continued operation of the CT Atlas for at least the next two years. Noting this, USAID’s Renerio Acosta lauded the CT Atlas team for their effort “to forge new agreements for CT Atlas to continue its forward momentum.” He said the meeting can be used by the other components of USCTI as a template for sustainability planning. Malaysia is home to spectacular and diverse marine life, protected and managed by its Marine Protected Areas (MPAs). The WorldFish CT Atlas team hosted a Marine Protected Area (MPA) Management Effectiveness Assessment Tool (MEAT) training workshop last week to demonstrate how MPAs can be evaluated. 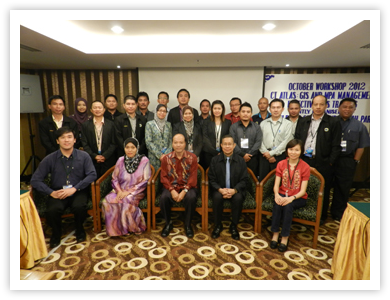 The workshop was held in, Penang on 21-22 February 2013. Participants included over forty men and women responsible for gazetting, monitoring, and managing MPAs all around Malaysia. Collectively they are the custodians of Malaysia’s stunning marine parks, and their associated biodiversity, which are of global significance. Managing MPAs is a considerable challenge and it’s important to know how effectively it’s being done. Good management of MPAs can have many benefits, including improving the supply of fish for local people, and increasing revenues from tourism. During the workshop, training was provided in the use of a specific MPA assessment tool, developed in the Philippines. The tool provides an objective assessment methodology for summarizing MPA management effectiveness across all socio-economic and ecological dimensions. A by-product of the training exercise undertaken during the workshop is a comprehensive and up-to-date overview of MPA management in Malaysia. The 12th International Coral Reef Symposium (ICRS 2012) will begin Monday, July 9-13, in Cairns, Queensland, Australia. The symposium will bring together international scientists, policy makers, managers, and conservationists to present the latest findings on coral reef science and management. Part of the official scientific programme of the ICRS 2012 is the mini-symposium on the Coral Triangle Initiative (CTI). If you are in Cairns next week, you are welcome to the presentation and visit the CTI booth to find out more about CT Atlas and CTI activities in Coral Triangle Region. The CT Atlas team hopes to see you there, so don’t hesitate to stop by and ask about the Coral Triangle Atlas!!!! The Coral Triangle Day will brings together individuals, organizations, and establishments from different parts of the region on one special day to celebrate the beauty and uniqueness of this region and to promote the importance of oceans through varied activities including: beach clean-ups; sustainable seafood dinners; educational exhibitions; marine-themed bazaars; and beach parties.People and organization are encourage to do one special thing, no matter how small, that will contribute to saving the Coral Triangle and let the world know how we care about it. Coral Triangle Atlas Beta Version is launched!!! The CT Atlas team is proud to present the new, updated beta version of the CT Atlas. Thank you all for your support and suggestions over the last three years. We have tried to incorporate all your comments into the improved Atlas. • An easier to navigate Home Page. Check out the "What's New" and "Events". Don’t forget to send any events you would like to share with the Coral Triangle community! • A new Forum. This space is dedicated to help GIS practitioners and managers to come together and answer questions or exchange ideas on spatial planning in the Coral Triangle. Please feel free to sign in and ask any questions you may have. • A new CT Dataset interface. This new interface makes it easier for users to find layers they would like to download or visualize on the online GIS interface. If you have any questions, don’t hesitate to post on the Forum! • New features in the Online GIS Interface. The GIS interface has been re-organized with new categories to match the CT Database and new layers have been added. New features such as creation of polygons have been added according to user’s demand. This new version was inspired by all your comments, whether from individuals or from the Penang Workshop. Please continue to give us your feedback and make this YOUR Coral Triangle Atlas. You can use the Forum which the CT Atlas team monitors or write directly to Annick Cros (). Thank you again for all your support, and enjoy the Beta version! I look forward to hearing from you. 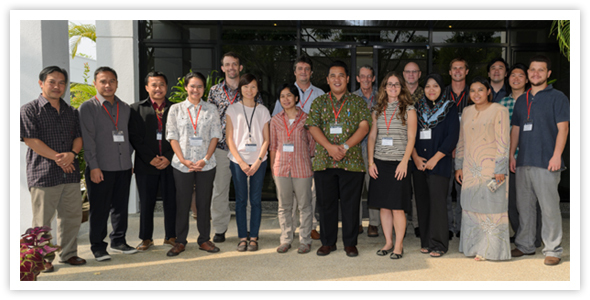 In June, WorldFish – a key partner and host of the Coral Triangle Atlas (database) - brought 18 GIS specialists and managers from across the six Coral Triangle countries together for the first CT Atlas Workshop. The Workshop sought to train each government on how to use the database and to strengthen the partnerships and data sharing between governments and NGOs to best represent the marine resources and conservation efforts in the Coral Triangle. The workshop was successful and the CT Atlas team is now working with each government to define MOUs for data sharing and planning for in country capacity building. First Coral Triangle Atlas training is coming up!!! The workshop will take place at the WorldFish Center in Penang, Malaysia from 21st - 23rd June 2011. The CT Atlas team is looking forward to meeting our colleagues from across the region. Participants at the workshops include government representatives from the six Coral Triangle countries, as well as staff from partner NGO’s. This is an exciting opportunity to build a strong Coral Triangle GIS team and to shape the CT Atlas to best serve the region. The Nature Conservancy-Indonesia Marine Program (TNC-IMP) has been working with the national, provincial and district governments, local communities, NGOs and universities since 2006 to design a resilient network of MPAs for the Lesser Sunda Ecoregion. The MPA network design was developed through a process which included both detailed scientific assessment and an extensive stakeholder consultation process. The design for Lesser Sunda MPA network includes 100 protected areas — 86 coastal MPAs for coral reefs, mangroves and seagrass that are linked to 14 larger offshore MPAs which encompass deep sea habitats important for endangered species such as blue whales thus incorporating all important ecosystems and species. The MPA network design builds on existing and planned MPAs and identifies additional areas for development of coastal and deep sea MPAs in the future. For any further queries please contact the lead author Dr Joanne Wilson () or at the TNC Indonesia Marine Program Bali office +62 361 287 272.